Family fact: My Grandma Cookies (that is what we called her due to her cookie jar) made my grandpa pasta everyday. Everyday it was some sort of pasta dish - I assume she switched it up. When we were over there I remember my grandma bringing a plate or bowl of pasta to my grandpa at the table. Pasta holds a special place in my heart. First thing - I am a Sicilian girl - I love pasta, I have organs made of noodles, marinara blood and olive oil for life fluid in my brain! My mom - busy working mom would make pasta for us, not the way grandma did but using jar sauce, ground meat and a loaf of bakery bread...In high school when I went vegetarian she started making me my own little pot of sauce so I could eat it meat free. Sometimes there would be a salad on the side - with ranch dressing. I find the idea of ranch + tomato based Italian sauces so tasty when others think it is gross. Whatever! I made pasta for Matt and I about 2 years into our relationship, I bought quinoa pasta and made olive oil chocolate chip cookies for dessert. That night I discovered I am deathly allergic to quinoa and what a good guy Matt is, when he spent the night cleaning up my barf from the bedroom to the bathroom. Enter the spiralizer. After finding out Matt can tolerate zucchini this summer (it is green after all) I went zucchini crazy! My mom gave me an Amazon gift card for my birthday and I read reviews and watched videos and decided on getting the GEFU Spirelli Spiral Cutter. I liked the size, the design and the ease of it. I wanted to get my zucchini pasta on in full force but knowing Matt I knew he would not dig that. So I have been doing 1/2 whole wheat pasta noodles and 1/2 spiralized zucchini. 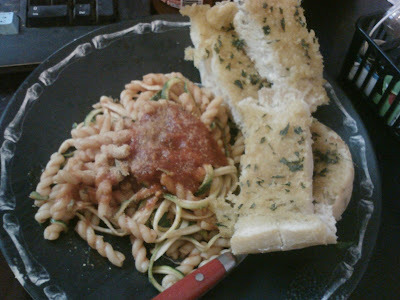 After draining the cooked pasta, I toss in the spiral zucchini and toss in the marinara sauce, so everything is at the same temperature.This is a good way to get greens into your pasta, cut down on wheat and/or try something new. People often think pasta dishes have to be heavy - you can lighten things up this way and still have all the great classic taste! great way to kick it off with Marinara Monday. I have such a hankering for garlic bread after seeing your photo, it looks so good! What a lovely blog. I try to eat and live vegan as much as I can. Great to hear that Italian love for pasta isn't a bit exaggerated. :) You just got me a need to try it with zucchini as well! Looks tasty! I've found that spiralized zucchini goes really well with soba noodles too, to lighten up an asian pasta dish.